A photo of a bald eagle nest at Magee Marsh Wildlife Area near Toledo. COLUMBUS, OH – Ohio’s resident adult bald eagles are already busy preparing for the next generation of eaglets, according to the Ohio Department of Natural Resources (ODNR). Female bald eagles in Ohio typically lay one to three eggs sometime in mid-February or late March. Eggs are incubated by both parents for about 35 days, and the young eagles leave the nest about three months later, usually before the Fourth of July. March is a fantastic time to get outdoors and view eagle nests, as the trees have yet to leaf out, providing the public great views of active eagle pairs. Bald eagles typically nest in large trees such as sycamores, oaks and cottonwoods near large bodies of water with an ample supply of fish, their preferred food. In Ohio, the western Lake Erie marsh region (Ottawa, Lucas, Erie and Sandusky counties) is home to a sizeable population of bald eagles. Excellent viewing opportunities can be found at Magee Marsh Wildlife Area, Pickerel Creek Wildlife Area, Ottawa National Wildlife Refuge, Mosquito Creek Wildlife Area and Killdeer Plains Wildlife Area. 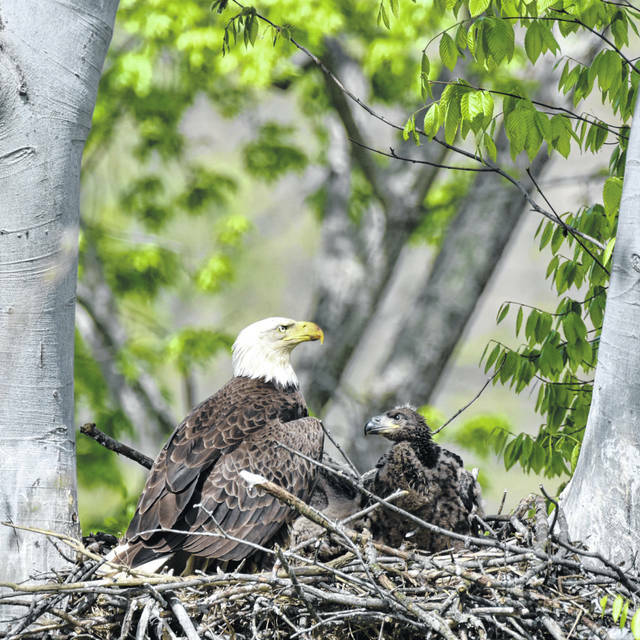 In the southern part of the state, eagles usually nest near major rivers such as the Muskingum, Hocking, Scioto and Great Miami. However, bald eagles can be found in nearly every county throughout the state, including urban settings. One famous pair resides just over 2 miles west of downtown Columbus along the Scioto River. COLUMBUS, OH – The Ohio Department of Natural Resources (ODNR) reminds Ohioans that small numbers of dead fish may be common in ponds and small lakes this spring. Winter die-offs of fish that result from long periods of heavy ice and snow cover on small waters are referred to as “winterkills.” Winterkills may occur in some Ohio waters this year as ice and snow from the past few months gives way to spring. Winterkills are caused when persistent ice forms a surface barrier between water and air that prevents circulation of oxygen and blocks sunlight. If these conditions continue long enough, the oxygen fish need to survive may be depleted and result in some or all of them suffocating. Winterkills are most common in shallow ponds and become obvious when dead fish are seen along the shore. Ohio’s northern counties are more susceptible to winterkill because of colder temperatures and more frequent snows. However, winterkills are possible in any part of the state during winters of persistent cold weather and snow cover. Fish die-offs are possible in Ohio’s larger lakes as well, but for different reasons. Some fish, such as gizzard shad, are less tolerant of long, cold winters and are commonly seen along the shorelines of reservoirs and Lake Erie during moderate winters. However, in larger waters, species that commonly die off following winter are resilient and return in great numbers following a single spawning season. Concerned citizens should not attempt to rescue stressed or dead fish. Handling stressed fish significantly reduces their chance of survival. Go to wildohio.gov to find more information about fish and preventing winterkills. Large numbers of dead fish should be reported by calling 800-WILDLIFE (945-3543). https://www.sunburynews.com/wp-content/uploads/sites/48/2019/03/web1_bald-eagle-nest.jpgA photo of a bald eagle nest at Magee Marsh Wildlife Area near Toledo.